allocation, risk and return landscape over the next five years. The second of our Factor-based Investing series will see us taking a fresh look at how Asian investors can enhance portfolio construction by a more efficient and intentional sourcing of excess returns. Our first webcast addressed “why factors”, this time we'll focus on the practical “how". 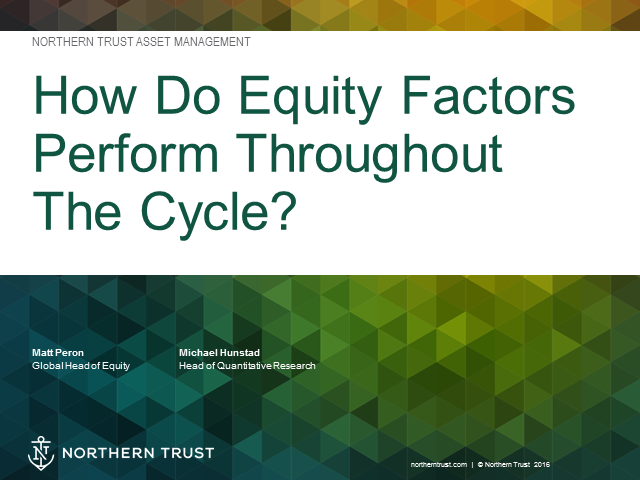 1.How investors can build and manage equity factor-based strategies that deliver the investment outcomes they want. 2.The obvious pitfalls that you can, and need to avoid. Our featured speakers are Matthew Peron, MD, global equity, and Michael Hunstad, SVP and Director, Quantitative Research, Northern Trust Asset Management. With two decades of experience managing these strategies, our experts have seen what works and what doesn’t. Covering timely topics such as smart beta, index and active investing this channel will provide the latest insight and expertise for institutional investors in the Asia Pacific region.